On May 20, 500 people from around the country gathered in Washington D.C. for an Occupy Our Homes rally, march and occupation of the Justice Department. The Washington event was a calling to account of the Obama administration, which five years after the crisis has yet to put one Wall Street criminal in jail for the massive wrecking of the world economy. It also highlighted the fact that millions of hardworking people continue to be foreclosed on and mistreated by the banks with their endless appetite for profit, no matter the human toll. 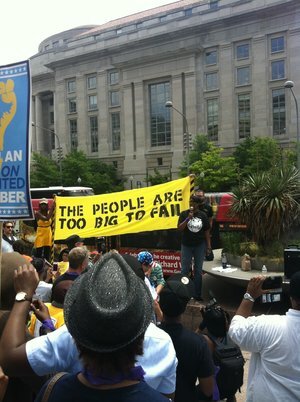 The unmistakable message of the rally was emblazoned on a large yellow and black banner: The People Are Too Big to Fail. This was a reference to the shameful comments by Attorney General Eric Holder that prosecutions of big banks could ultimately be impossible because they are “too big to fail.” This spurious logic has been used since 2008 to affect a massive transfer of wealth—literally trillions of dollars--from the Federal government, to the banks and other financial companies. The day’s events began with a rally where a number of people from places as diverse as Seattle, Los Angeles, Minnesota and Atlanta spoke about how they had either lost homes or were faced with the threat of losing their homes. They mentioned the ruthless treatment of banks, who despite having received huge sums in taxpayer dollars, and having signed agreements supposedly to assist homeowners, continue to rob people of their basic human rights. Participants then marched to the Department of Justice (DOJ), taking several downtown streets, blocking and slowing down traffic on some of D.C.’s most significant thoroughfares. Then over two dozen victims of foreclosure or those on the brink of being victimized staged an occupation of one entrance of the DOJ. 25 have been arrested as police cleared out the occupation after an overnight stay. Despite the fact that protestors were vocally non-violent, police showed up with assault weapons and riot gear. Some protestors were even tasered by police during the arrests. This sort of heavy-handed action shows quite clearly who the government serves. Not one banker in jail, but hardworking homeowners are tasered and arrested for defending the basic human right to housing.